You will be met dockside by your private guide and driver for your tailormade half day tour featuring the highlights of Auckland City. Auckland - ‘City of Sails’ is regularly voted one of the best lifestyle cities in the world. Set on the shores of the Waitemata Harbour, Maori name for ‘sparkling waters’, the city boasts marine reserves, golden swimming beaches and black sand surf. As New Zealand’s largest city, Auckland has a diverse ethnic mix providing a myriad of cultural experiences, reflected in the Pacific atmosphere and cuisine. Enjoy a visit to the Auckland War Memorial Museum standing in the Auckland Domain on the rim of an ancient volcano, one of a number of extinct volcanoes within the Auckland region. Enjoy an authentic display of Maori culture. Following the Maori Performance experience what is known as the world’s best collection of Maori Taonga (Treasures) and South Pacific artifacts at the Auckland Museum. For a bird’s eye view of Auckland, its harbour and outlying islands, visit the Sky Tower which soars to an incredible 328 metres above Auckland, offering the best views of the city. The tallest building in the Southern Hemisphere, the Sky Tower has four observation decks including an outdoor deck, glass lift and floor panels, and multi lingual audio guides. 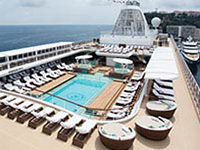 You will be returned to embark your cruise vessel following your touring (approximately 4 hours duration). the Takatu Peninsula and Matakana Coast. The Takatu Peninsula is a very ‘undiscovered’ part of Auckland’s eastern coastline, looking out to Kawau Island and encompassing the fabulously uncrowded surf beaches of Tawharanui Regional Park. Vineyards, museums and the crafts and pottery at nearby Matakana add to the charm of the region. Begin your drive north over the Auckland Harbour Bridge viewing the Waitemata Harbour and the North Shore areas of the city before entering the tranquil countryside of the Rodney District. Upon arrival at Brick Bay Wines, enjoy a shared platter style lunch (including glass of local wine, tea/coffee and sweet treat) at the Brick Bay café overlooking the sculpture exhibits and vineyard. Following lunch, enjoy walking through their sculpture trail. Showcasing contemporary sculpture by established and emerging artists, you will experience the art in a remarkable landscape framed by towering native trees and majestic palms, abundant birdlife, and green pastures all overlooking the celebrated Brick Bay Vineyard. It is a unique outdoor gallery experience, where an ever changing display of 25 to 30 works is sensitively sited along the 2 kilometre trail. The track is an easy one hour walk suitable for most ages and abilities. Surfaces on the trail are grass, bark mulch, pebbles and wooden boardwalks. The trail is undulating terrain that winds through a valley, there are several sets of easily negotiated stairs and viewing benches are located at regular intervals along the trail. Continue to Tawharanui Regional Park - for a leisurely walk to view the natural wonderland of the bush and beach followed by a drive to the beautiful Leigh Harbour via the scenic Matakana countryside if time permits. Return to Auckland - if time permits there may be the opportunity to visit some of the local vineyards, such as Ascension, Heron’s Flight Vineyard and Hyperion Wines. 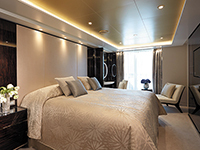 You will be returned to embark your cruise vessel following your touring (approximately 8 hours duration). You will be met dockside by your private guide and driver for your half day tailormade tour featuring the highlights of the Auckland region. Auckland - ‘City of Sails’ is regularly voted one of the best lifestyle cities in the world. Set on the shores of the Waitemata, Maori name for ‘sparkling waters’, the city boasts marine reserves, golden swimming beaches and black sand surf. As New Zealand’s largest city, Auckland has a diverse ethnic mix providing a myriad of cultural experiences, reflected in the Pacifica atmosphere and cuisine. Travel west to the spectacular West Coast beaches, where you will experience the magnitude of the area, the softness of black sand and the cool ocean breeze. Visit Muriwai Beach to enjoy the opportunity of a light walk and explore this unique New Zealand coastal landscape with its rugged surf pounded cliffs .View the nesting sites of one of the world’s largest sea birds, the Gannet, in their natural environment. Return to the Kumeu area - New Zealand’s most concentrated wine making region which has a distinct Mediterranean flavour. Many of the vineyards were settled by Dalmation migrants in valleys and on the sunny slopes footing the dramatic Waitakere Ranges. There is the opportunity to enjoy wine tasting if desired. Upon disembarking at Tauranga you will be met by your private guide and driver for a full day’s sightseeing tour of Rotorua tailored to suit your interests and requirements (approximately 1 hours journey). Rotorua – heartland of New Zealand’s Maori culture. Surrounded by steaming lakes, bubbling hot pools and bursting geysers, Rotorua is host to some of the worlds most incredible earth forces, capturing all that is precious and unique – feel its spirit ~ Mannakitanga. Visit the Rotorua Museum of Art & History for an insight into this fascinating thermal area. The Rotorua Museum inhabits a building that is a national icon, recognisable throughout the world. The lavishly designed Tudor-style building opened as a spa in 1908 and was later refurbished to reopen as the Museum it is today. Enjoy lunch at one of the local restaurants (cost not included). Continue to the Maori Arts and Crafts Institute and Te Puia Thermal Valley. See Maori people weaving traditional flax objects, and continue to the thermal area where exploding from the ground up to 30 metres high is the world famous Pohutu Geyser – an awesome display of mother nature’s power. Ten to 20 times a day it bursts into life; a tourist attraction since the early 1900’s. See silica terraces, bubbling mud pools and unique geothermal vegetation - each of the geothermal wonders is woven into a legend surrounded by memories and sometimes mystery. 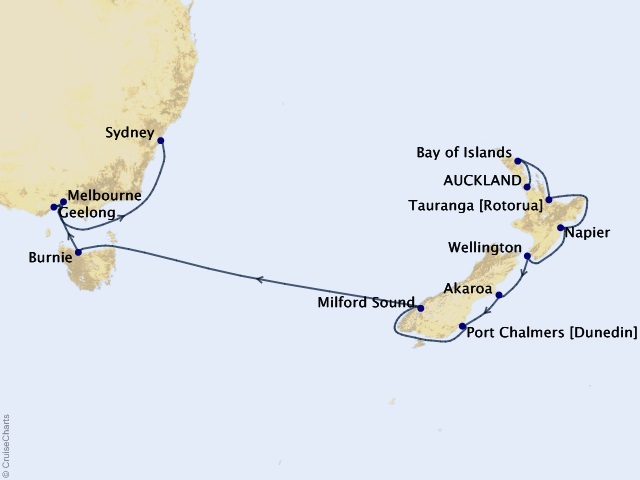 You will be returned to Tauranga to embark your cruise vessel following your touring (approximately 8 hours duration). You will be met dockside at the Port of Napier by your private guide and driver for a full day tour of Hawke's Bay, including highlights such as food and wine, sightseeing, history, Maori culture and artists and also spend time with some of the personalities of the Bay. Taste wonderful wines, meet fascinating artists, explore stunning scenery, absorb history, enjoy a drive to the summit of Te Mata Peak for stunning views of the region (weather permitting) and enjoy a platter lunch at a winery restaurant. Visit and talk with a Maori who can provide a spiritual insight into their culture and can clearly demonstrate what it is that makes this indigenous people so special. He will give you a cultural welcome on to their land. 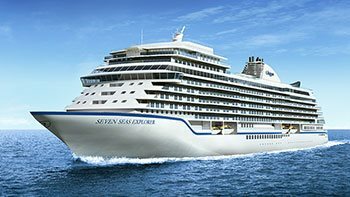 You will be returned to embark your cruise vessel following your touring (approximately 7 hours duration). You will be met dockside by your private guide and driver for your tailormade half day tour delving into the magic that is the Lord of the Rings and The Hobbit trilogies. Sir Peter Jackson, Oscar winning film director & Sir Richard Taylor Oscar winning special effects director, both live in Wellington. Their studios, Post Production office, Weta Digital effects and Weta Workshops are based here. During the tour you’ll drive by the Embassy Theatre which hosted the World Premieres of LOTR, The Return of the King in 2003 & The Hobbit, An Unexpected Journey in 2012. Enjoy a 45 minute guided tour at Weta Workshop, where the story of the creative process is told by crew members, using the props, models and weapons they helped make for the Lord of the Rings and The Hobbit trilogies. See the work being undertaken inside one of the world’s leading movie effects operations and visit Weta Cave Shop - a cavern of creativity in its own right boasts a huge range of movie merchandise. Continue to Mount Victoria to view film locations for The Outer Shire & The Race to the Ferry, before returning to embark your cruise vessel following your touring (approximately 5 hours duration). You will be met dockside by your private guide and driver for your tailormade half day tour to the elegant Eastern Suburbs. Wellington – Capital City and cultural centre of New Zealand. Nestled between a dramatic harbour and bush clad hills, this thriving characteristic city is home to a feast of attractions including theatre, arts, parks and museums. Travel to the residential area of Lowry Bay, travelling via the Hutt Valley and Petone Esplanade, enjoying views of Somes Island and the Northern reaches of Wellington Harbour. Arrive at a gracious private home and enjoy morning tea, followed by an optional walk in your Hosts garden. Continue your scenic drive to Eastbourne and onto Days Bay, where you can enjoy a stroll on the level coastal track to enjoy vistas of the Wellington Heads, Cook Strait – and on a clear day, out to the Kaikoura Ranges. You will be met dockside by your private guide and driver for your tailormade half day tour featuring the highlights of New Zealand’s vibrant capital city, Wellington. Enjoy dramatic views of the city from Mount Victoria before continuing on a short drive to 'Te Papa' - The Museum of New Zealand where you will enjoy highlights on an informal guided tour. There will be the opportunity for some shopping at the excellent souvenir shop. Continue by driving past Old Saint Paul's Cathedral - the finest example of Revival Gothic architecture in the Southern Hemisphere, and the largest wooden building in the Southern Hemisphere. Travel via the famous Beehive and Parliament Buildings, highlighting the differences in architecture between the old and the new. Continue to the Botanical Gardens, where you will find the exquisite Lady Norwood Rose Gardens, which invite for a walk if time permits. This extended half day tour is one of the best ways to get to know the ins and outs of Melbourne. After meeting your private guide and vehicle at the cruise terminal, you will begin unravelling Melbourne’s history by driving along The Golden Mile, past the Old Treasury Building, Parliament House and the world heritage listed Royal Exhibition Building. Migrant groups give Melbourne its edge. Visit some of Melbourne’s cultural precincts and grab a sidewalk coffee at a chic laneway café. For Melbournians today, life revolves around food, fashion, beaches and sport. Take some time to connect with the city and its people with this ‘local’s look’. Meet the faces behind the produce at Melbourne’s Queen Victoria Market. Many are real entertainers and have had their stalls passed down through generations. Your taste buds will be left tingling as you sample their wares. Take in the grandeur of Melbourne’s sporting precinct to help you truly understand this city’s obsession with sport. Enjoy a stroll through some of Melbourne’s iconic laneways – home to the best and unique bars, galleries, boutiques and cafés in the city. Lunch at a local restaurant is included today. After lunch, you are transferred back to the city and your cruise vessel. This morning you will be met at the cruise terminal and transferred to Federation Square in the city by private transfer, where you start your private walking tour of Melbourne’s hidden gems. Melbourne’s arcades and laneways hide many gems. Join this indulgent walk through Melbourne's beautiful back streets, and get orientated in the life of the city that locals love. Discover local designers and specialty retailers that often are only found in the city. Some of the quirkiest cafes, independent designers, street art, architecture, and historical tales are found in these walkways. There is something for everyone, locals and visitors alike. See over 30 stores on this casual stroll. Morning tea is included before a restaurant lunch. The tour will conclude after lunch where you will be returned to your cruise vessel by private transfer. Your private guide and vehicle will meet you at the cruise terminal for your full day tour to the Great Ocean Road. Get an insight into Australian surfing culture at Bells Beach, with rugged cliffs and big waves. Visit and learn about the historic Split Point Lighthouse, located in the town of Aireys Inlet. This beacon of light is credited with saving hundreds of ships and thousands of lives along Australia’s treacherous ‘shipwreck coast’. Soak up the atmosphere of Victoria’s premier holiday town, Lorne, before marvelling at the cliff-hugging road that stretches between Lorne and Apollo Bay. It is one of the most spectacular roads in the world, home to monstrous cliffs, roaring seas, tranquil coves and secluded beaches. En route, visit the wild Koalas of Kennet River and get acquainted with some of Australia’s most colourful birds. A delicious lunch at a local restaurant is included this afternoon. Then climb aboard your helicopter and take one of the world’s most truly greatest scenic flights. For the rest of the road you’ll be flying high. Enjoy breathtaking aerial views of the 12 Apostles, Moonlight Head, The Cape Otway Light station, Gibson’s Steps and Loch Ard Gorge before a gentle touch down back in Apollo Bay. Your journey back to Melbourne is a relaxing drive that will take you through the majestic Otway Ranges before arriving back at your cruise vessel. Your private guide and vehicle will meet you at the cruise terminal for your luxury eco-tour into the heart of a unique World Heritage Region, Blue Mountains. Continuing your journey to the Blue Mountains National Park, where you will enter a little known hidden clearing to unlock a piece of Australia you would never have known existed. Enjoy morning tea in a secluded valley, where you may see kangaroos grazing in the wild. Visit a number of scenic lookouts, including Kings Tableland with its breathtaking views over the Jamison Valley. See firsthand the ruggedness and beauty that the Blue Mountains are famous for. Lunch is included today at a local café in the heart of the Blue Mountains. Then head to Wentworth Falls and take a short walk to the falls with your guide. Enjoy stunning views and experience the local flora and fauna up close as your guide shares their knowledge of the incredible geology of the Blue Mountains and how they were formed. Re-join your vehicle and travel towards the township of Katoomba. At Eagle Hawk lookout you will see the famous Three Sisters and learn the Aboriginal legend behind this famous rock formation while marvelling at the stunning views of Jamison Valley. Then continue around Narrow Neck Plateau for more incredible vantage points. Then sit back and relax during your journey back through Sydney’s western suburbs and across the ANZAC Bridge to reboard your cruise vessel. Your private guide and vehicle will meet you at the cruise terminal for your full day tour to the Hunter Valley. 180 years young, the Hunter Valley is Australia’s oldest and best-known wine region. It’s a dynamic and fascinating area that is home to over 150 top-class wineries, 65 indulgent restaurants as well as gourmet produce and boutique breweries. Travelling north over the Sydney Harbour Bridge, your first visit is to a 5-star winery nestled in the Mount View region of the Hunter Valley, a well-renowned viticulture area, where you sample exquisite wines in a private area. Then continue on to Leogate Estate, one of the most highly regarded vineyards in Australia. This opulent cellar door is the perfect place to enjoy that unique taste which only the Hunter Valley and their award-winning wines can provide. Sample a selection of cheeses to accompany your wine tasting, followed by a tour of the onsite winery to learn of the winemaking process. Then enjoy a relaxing 2-course lunch: a selection of platters with a glass of red or white wine, followed by a dessert of choice. After lunch, travel to Keith Tulloch Winery, a small family owned winery and vineyard produces wines that express the unique terrain and climate from the ancient soils of the Brokenback Range. Enjoy a unique wine tasting experience in collaboration with artisan chocolatier “Cocoa Nib”. Sample five handmade praline chocolates, matched to the wineries current release wine – a sensational way to conclude our day in the Hunter Valley Wine Region.